This case designed for a major electronics and computer equipment manufacturer. 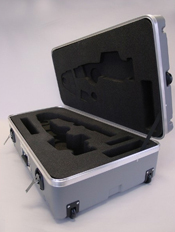 Shipping sensitive electronic equipment often requires the added protection provided by custom foam inserts. Custom machined foam can provide a sung fit that will minimize shock and reduce movement of the equipment. For extremely sensitive equipment like microchips or circuit boards, anti-static foams that protect against electrostatic discharge can be used. If purity or outgassing is an issue, crosslinked foam expanded with nitrogen can provide a safe solution. 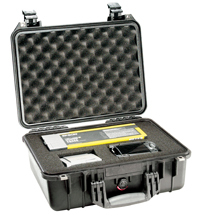 Pelican shipping cases are ideal for the packaging of many types of electronics due to their watertight seal and extreme durability. As one of the nation’s largest distributors of Pelican cases, we have extensive experience in fabricating inserts for their entire line.